** I try to do a fresh burger list ever year. Click here for the 2011 edition. 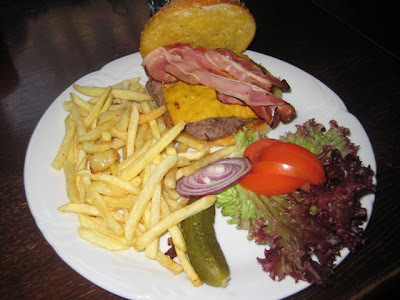 More than a year ago, I did my own survey of Prague's hamburgers. I certainly wasn't the first to do so. 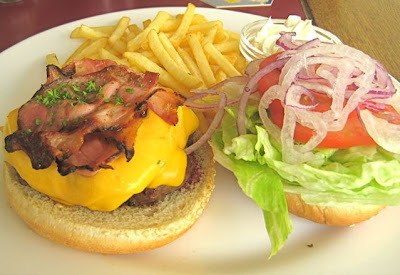 This particularly American food has been a very popular topic here, and my burger post received big hits. 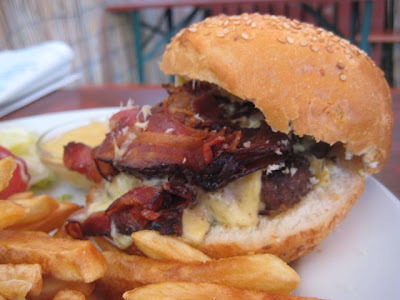 As I noted then, The Prague Post used to do an annual article on Prague's best burgers. 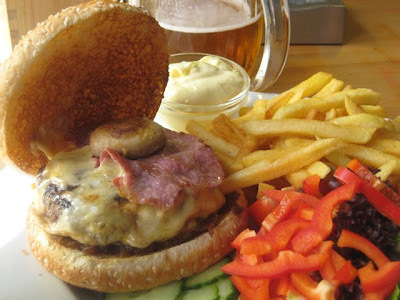 And I saw that Laura Baranik of Prague Spoon fame just published a review of several burgers in Lidove noviny. For the past several months, I'd been collecting fresh burger data for an update. So, I thought now would be a good time to put out my own list. 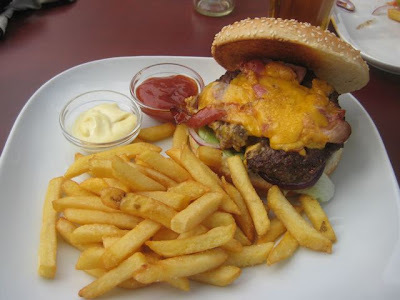 This post will not tell you what is the best hamburger in Prague. But it will tell you what I like the most. And the least. My survey is far from comprehensive -- burgers are becoming increasingly ubiquitous in the Czech capital. But it is a much longer list than any other I've seen out there. And I've got pictures. 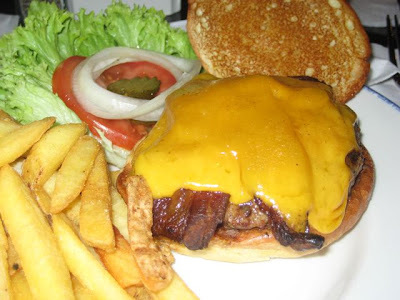 I always ordered a bacon cheeseburger, if possible, which usually came with fries. I ate some of these burgers quite a while ago -- the price listed usually reflects what I paid. If the burger has changed since my visit, let me know. Anyway, let's begin with my least favorites and work our way up to my most loved. And it is love. 16. Jet Set City Center (180 CZK) The most unpleasant piece of meat I have encountered. It was well done, to the point of being dry and rubbery. I actually got tired chewing. I lost the will to finish it. The bacon was, let's say, un-American -- very ham-like. Also, I'm not a big fan of the more ball-like patty style. They must have fried the hell out of it to cook that thick meat all the way through. 15. Red Hot & Blues I did not like this big, bad burger. The best thing I could say about it was that it was large. The ground beef was rubbery, and the bacon was a disaster. The slices of pork were so overcooked, they had the consistency of a Visa card. And this was not a one-time mistake. Their bacon at breakfast was bad, too. And to top it off, they put some cheap ketchup in my Heinz ketchup bottle. Either that or they mixed the real stuff with water. I'm sure I'm not the only one who can tell the difference. I don't recall what the price was -- I lost the receipt, and I don't think their website is up to date. 14. Cafe Imperial (235 CZK) They called it the "Double fist" Hamburger." It was quite wide. But the patty was also surprisingly thin. And even stranger, given the lack of depth, was that the one served to me was practically raw. I'd rate it higher if it was cooked properly. But I was also put off when I found cucumbers on top. That's just wrong. My favorite thing about this one was the perfect grilled onions on top. 13. Mozaika (199 CZK) I do not give extra points for creativity. In fact, on my list, I take them away. Mozaika's burger was too clever by half. The meat was too peppery. 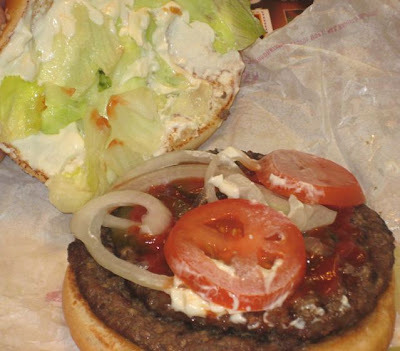 The grilled onions, combined with bacon, cheese, lettuce, and tomato did not combine well. It was chaos under the bun. The thing was certainly large, but felt like a rock in my stomach. Overall, I like Mozaika, though it seemed to have lowered its standards on our last visit. 12. Ultramarin (220 CZK) This burger has gotten some positive press, but I didn't like it much. The menu said it was cooked on a "lava grill," but I could not taste it. The flavor was undistinguished. The beef was cooked well-done, and it was slightly rubbery. It had onion jam on it, which was unconventional, a little too sweet, but not terrible. However, I was disappointed by the single mushroom cap on top. That didn't work. They should have cut up a few more and fried 'em. The bacon was too hammy, which I don't like. There was no tomato on the side, just red peppers and cucumbers. On the plus side, it was huge. And it had a great bun. 11. 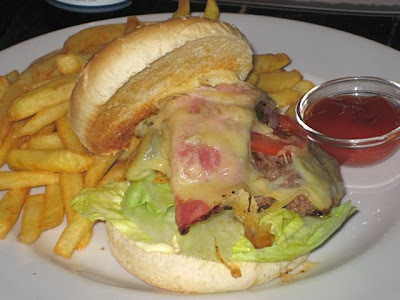 Cafe Bar Wigwam (115 CZK) This is the burger I love to hate and hate to love. It's always a train wreck. Being a regular at the restaurant, I've probably had more of these than from any other place. And it seems like every week, it comes out differently. But in general, the meat is almost always overcooked and too salty. The crumbly, low-quality bun is a repeat criminal offender. Construction is usually haphazard. The bacon is smoky, but rarely crispy. It's often drowning in mayo. I wouldn't recommend this burger to anyone. It shouldn't rank this high. And yet... I have a place in my slowly clogging heart for this thing. Don't ask me why, it's not rational. 10.Burger King (109 CZK includes fries and Coke) That's right. I liked the Whopper more than all the burgers listed above. Harsh and somewhat twisted, I know. But that's how I feel. 9. Fraktal (170 CZK) They have a flame grill. I saw the burgers flaring up on it. But I could hardly taste it. Very disappointing. The beef had a seasoning that I didn't mind so much. But the meat also had a slightly rubbery consistency. The melted cheese was excellent, and the bun was good and strong. If they hadn't murdered the bacon, I'd have rated it higher. And the fries weren't hot. 8. TGI Friday's (270 CZK) This burger's flame-broiled patty reminded me a lot of Burger King. 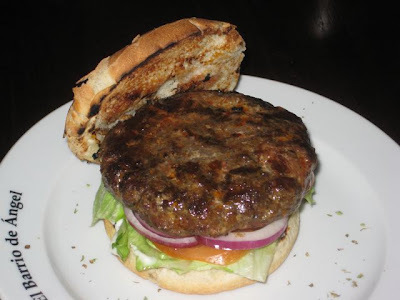 The meat is thicker and juicier than a Whopper, but still thinner than many other burgers on the list. There was great American-style bacon. To me, it's a gourmet version of a Whopper. Except they put the toppings on the bottom. Not good for them. 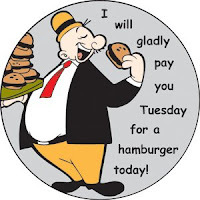 I don't love the restaurant, but I liked this pricy burger. One important thing you should know: at the Anděl location, it was 40 CZK cheaper than at the Na Příkopě TGI Friday's. I did have a bad service experience at Anděl. But their great chocolate shake put me in a forgiving mood. 7. Jama (205 CZK) The menu offers a bacon burger (175 CZK) and a cheddar burger (175 CZK), but no combo. 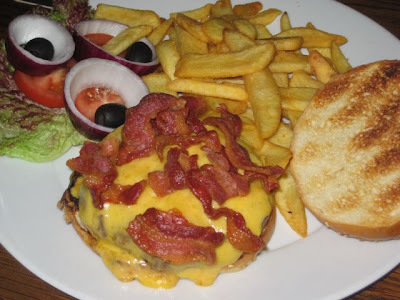 To achieve full bacon cheeseburger status, you have to order one of the above burgers, and then add extra cheddar (45 CZK) or extra bacon (45 CZK). 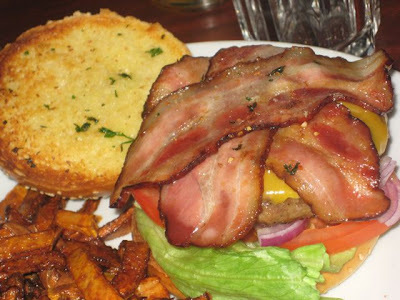 On the hefty burger I had, the bacon had the tell-tale signs of being deep fried rather than pan fried. Also, the onions were cut so thick, they wouldn't fit under the bun. The owner later wrote me and said those things would be fixed. But I returned and the onions were the same. I didn't recheck the bacon. The meat was good quality and juicy, but pan-fried. Good toasted bun and plenty of cheese. 6. U Maleho Glena (155 CZK) This one was pretty good and hit a lot of the right classic notes. The meat was juicy and flavorful. But I believe it was pan-fried. The bacon was plentiful and smoky, giving it almost a grilled taste, but it was soft and not really crispy. The tomatoes were sliced in annoying, awkward wedges. Red lettuce is not my favorite for burgers. The toasted, buttered bun was a real winner. It was among the sturdiest, holding everything together very well, and yet not too heavy. I didn't subtract a point because the cook disappeared and didn't start cooking for 15 minutes after I ordered when I was super hungry. 5. Golf & Country Club Hodkovičky (235 CZK) Good burgers at a golf club? Even I was shocked. This burger probably would win the contest for best looks. Everything was well-balanced and proportioned. I really loved the flavor of the ground beef. Just the right fat content. I didn't like the lettuce, tomato, and onion sitting under the meat. I'd downgrade them for only giving a tiny dish of ketchup and forcing me to ask for another one. 4. El Barrio de Ángel (159 CZK) Cooked on a flame grill, this ground beef came all the way from South America. The patty was well-seasoned, with a perfect amount of salt. The low fat content made it very dense and even a bit dry in the middle. 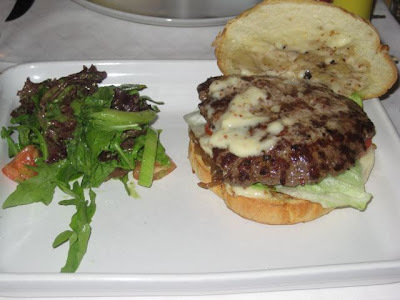 Still, juices dripped on the plate -- the chef brushes the burger a lot on the grill. It came with lettuce, tomato, onion, and mayo already on it. It was well-constructed. But I'm not a big fan of having mayo already on the burger, except at Burger King, where I have been conditioned to expect it. 3. Hard Rock Cafe (280 CZK) This one wins the prize for best flame-grill flavor. They put a char on that baby without ruining the meat inside. The bacon was top quality stuff, but overcooked at the edges. For me, there was just a little too much melted cheddar cloaking the good quality meat. The bun was strong and nicely toasted, but a little large and out of proportion to the size of the patty. The lettuce, tomato, and raw onion rings were good and correctly sized. I was happy to see some pickle slices. Despite my small criticisms here, this was a great burger, and I had a real hard time ranking the top three. I love them all. 2. Potrefena Husa on Vinohradska (248 CZK) I eat lots of these Husa burgers because I live nearby. They are truly great. They are cooked on flame, and you can always taste it. The meat is high quality, but perhaps a little too lean, leading to some dryness if it is cooked too long. The patty was small for the bun, but still very filling. The bun is one of the weaker ones. 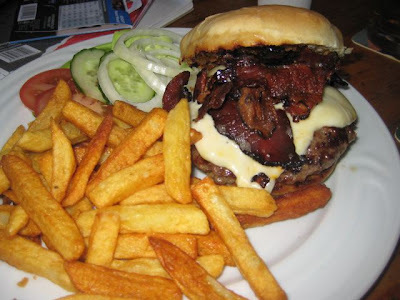 The bacon isn't exactly American-style, but it is usually cooked more crispy than usual for English style. The lettuce, tomato, and red onion are cut and sized just right, so it all fits together well. They give you different types of Heinz ketchup to go with it. I wish it wasn't so costly, but I should note that it used to be much more -- around 300 CZK. They dropped the price. Smart move. But still an expensive habit. 1. Bohemia Bagel in Holešovice (155 CZK) I wish I could get to this restaurant more often. Only because I love this burger. It strongly appeals to my fire-cooked bias. The ground beef is lightly salty and juicy. The bacon occupies that place in the American-English divide, not as crispy as I'd like, but there's usually plenty of it. There's red onion, lettuce and tomato already on there. But I'd take a point off for them putting it under the patty, where the juices run into them. They should be on top. Then, there is the great, toasted, buttered bun, which is like the one used at U Malého Glena (both started by Glenn Spicker). It's the perfect size and helps make this burger great. And I confess, the great price does help it taste a little better to me. But like I said, the top three are almost interchangeable in my book -- all delicious. I'll just add at the end that, putting aside individual components, I just ranked these hamburgers according to my level of eagerness to have another one. Maybe you have a different list. Or you don't like hamburgers at all. That's fine. I don't want waste time fighting about it. I still have a lot more hamburger eating to do. Good question. In a word, no. Most people are surprised, if not annoyed that I am not overweight, given my conspicuous consumption. 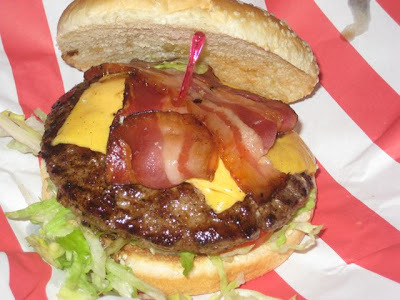 Why is it that (non-Americans) insist on thinking burgers are fattening??? Hello people, if you take away the bun/cheese, it's steak with a salad. Ever heard of the Aitkens Diet? I remember the first time my father-in-law was in America. After I'd endured years of "ha ha, you people only eat hamburgers everyday" I made sure to BBQ him a real burger. The look on his face when he first tasted it was worth the price of admission. "But... this... is... good?!?" Keep an open mind people. 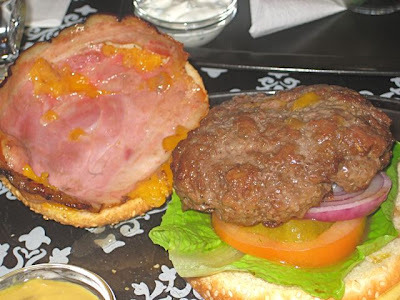 Yes, the "burgers" served in most pubs here are pretty awful. Americans can't do svickova and knedliky; that doesn't mean the real thing can't be great either. The burgers are OK at Bohemia Bagel in Holesovice, but the chips are usually soggy and cold. Practically nothing comes out of the kitchen warm. Just come back from great time in Prague. 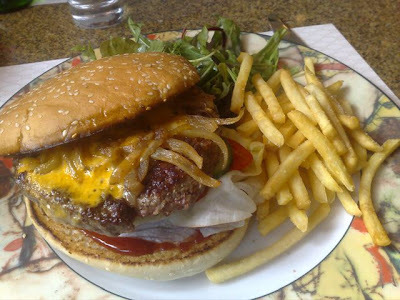 I would rate Restaurant Jama, Number one, really tasty, best burger I have had, for along time !. Also I like Bohemia Bagel,s chip,s. When I had them they were hot!, and better then other,s I had while on holiday. I can't say I've ever had a burger in Prague other than fast food. Years ago (16) McDonald's had something called a Mcbucek (c with a hat) that had cheese and a round bacon slice. The bacon had more fat than Canadian bacon and also sliced thinner than usual. It was a regular sized burger so it was small but tasty. This was when McDonald's was considered very expensive so I think this was a budget offering. You're right on target to point out the problem with toppings not cut properly and improper proportions of cheese.